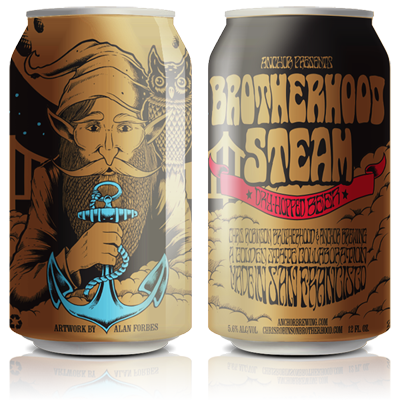 San Francisco, CA (November 19, 2014) – Today, Anchor Brewing Company and the Chris Robinson Brotherhood announce the limited release of Brotherhood Steam Beer in cans and on draught. A collaboration between the iconic brewery and band, Brotherhood Steam Beer is a celebration of originality and craftsmanship, bringing together handcrafted California brews and California tunes. A time-honored tradition for English breweries is to designate their beers as “Ordinary”, “Best”, “Special”, and “Extra Special Bitter” to note beers of increasing strength. Brotherhood Steam Beer (5.6% ABV) is an “Extra Special Lager” (ESL) – aka “The Gig Beer” – meant to be an easy drinking brew from the first set to encore. "We are over the moon that our collaboration with Anchor Brewing has brought us into the world of craft beers and couldn't be more excited to bring this Golden State collaboration to a broader national audience,” said Chris Robinson. We hope those able to indulge in the Brotherhood Steam Beer share in our experience of the good times to be had with a stellar beer in hand and the cosmic vibes of the CRB in the air." Inspired by CRB’s song-craft and the brew-craft of our flagship, Anchor Steam ® Beer, Brotherhood Steam Beer is a unique blend of pale and caramel malts and dry-hopping with Citra and Nelson Sauvin hops. The result is a copper color brew with aromatic hints of citrus and mint, a smooth, full-bodied malt flavor with a lingering, fresh hop finish. The artwork for Brotherhood Steam Beer was created by San Francisco-based artist Alan Forbes, who specializes in rock music posters and has been collaborating with Chris Robinson for over 20 years. For a limited time, Brotherhood Steam Beer will be poured at select Chris Robinson Brotherhood shows and in 6-pack cans in select markets nationwide starting in early December. Anchor Brewing Company announced their first canned beer, Anchor California Lager®, this year in May. Brotherhood Steam Beer marks the second canned brew to join Anchor’s lineup of distinctive, handcrafted beers. To learn more about the Chris Robinson Brotherhood, visit www.ChrisRobinsonBrotherhood.com. On April 29th, the Chris Robinson Brotherhood returned from gathering the ineffable with PHOSPHORESCENT HARVEST, their third long-playing album for Silver Arrow Records. Having first unshackled the air with Big Moon Ritual (June 2012) and The Magic Door (September 2012), the band--Robinson (Lead vocals, guitar), Neal Casal (guitar, vocals), Adam Macdougall (keys, vocals), George Sluppick (drums), and Mark Dutton (bass, vocals)--trucked the realms relentlessly, including a 118-show stretch that never failed to illuminate blank nights to just this side of clarity. Late 2013 saw the fruits of that labor forever captured in the proverbial amber by legendary tape priestess, Betty Cantor-Jackson (Grateful Dead), on the eight-sided limited-edition vinyl release Betty's S.F. Blends Volume 1, which documented a glorious five night run at San Francisco's famed American Music Hall. Momentarily content with dusting the globe and turning the sun out at its scattered dances, the Brotherhood reconvened with producer Thom Monahan (Vetiver, Devendra Banhart, Papercuts) to materialize a new set of sounds unseen to lean on ceilings, a music of the spheres not content to just envelop rafters. The writing partnership and dialogue between Robinson and Casal has never been as closely woven as it is on PHOSPHORESCENT HARVEST, almost akin to the conversation you hear murmuring out of the mouths of the moon and the stars as they glide the celestial track. This isn't a range they ride alone though, and as strong as the songwriting gets does too the rest of the band's willingness to seek company in chaos' warm embrace, discovering that in familiar forms there can glow a vastness. PHOSPHORESCENT HARVEST features ten new songs that build on the California group's impressively growing repertoire by combining the direct and immediate songwriting Robinson has long been known for with an expansive sense of space and texture that has never been so fully realized until now. In an age when so many put their beliefs in trends, the volumes have all collapsed and rooms are filled with tiny rock and dampened lamps, the Chris Robinson Brotherhood rolls on to sharpen the blur at your brow and wind like smoke through your mind.